It's been hot and humid for weeks now in Southern Illinois. All I want to do is swim. Good thing we've got a lovely little public beach on the lake nearby. Hoping to head there tomorrow. I've been thinking about swimwear a lot this summer as I spent a good chunk of my studio time illustrating swimsuits for a commission. A few months back, I was asked to create some original artwork for a brand new tiny house rental cabin near of Lake of Egypt. The stylish, light filled interior of one of the Dam Near Lake of Egypt micro cabins. Photo courtesy of Dam Near Cabins. Pops of red, yellow and blue set off the mainly white, bright interior. Photos courtesy of Dam Near Cabins. I got to tour this cabin right before they finished it and I've got to tell you, it's gorgeous. It's diminutive 550 square feet is packed with high end finishes and feels light, spacious and airy. I would love to stay here sometime! * All cabin photos courtesy of Allison Hassler, Dam Near Cabins. The Dam Near micro cabins have a sleek, modern, and full sized kitchen and bathroom. Photos courtesy of Dam Near Cabins. She asked me to illustrate vintage swimwear and I was happy to oblige. I was excited to revisit collage and take a break from abstraction, so I quickly got busy looking for source material. I took my cues for color from the pops of aqua, red, and yellow found in the cabin furnishings. A mixed-media illustration based on a vintage Tom Brigance swimsuit. I started with this adorable 1950's skirted suit designed by Tom Brigance. I did a preliminary drawing of the suit on red polka dotted paper, and then added in the details with my trusty black Bic ballpoint pen. A classic 1950's bathing suit illustrated with patterned paper and black Bic ballpoint ink. A vintage 1950's bathing suit that doesn't look that idea for swimming that I illustrated for a client. Though this one seems older to me, this is also a 1950's Tom Brigance design. It was made cotton and rayon, but almost looks like velvet to me. It doesn't seem that practical for swimming, but that's nothing new. Have you seen this suit that can't get wet and is dry clean only????? The original illustrations framed up and hanging in the bathroom at the Dam Near micro cabin. Photos courtesy of Dam Near Cabins. 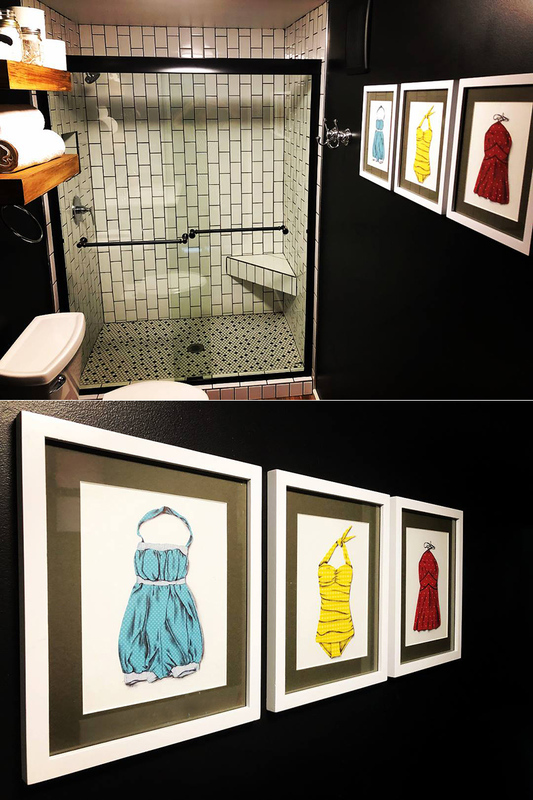 A couple of weeks ago, Allison shared these pictures of my illustrations framed up and hanging in the bathroom. They look great, don't they? I'm so pleased with the way they turned out and so were my clients. Vintage swimsuit prints are here! Click through to purchase. 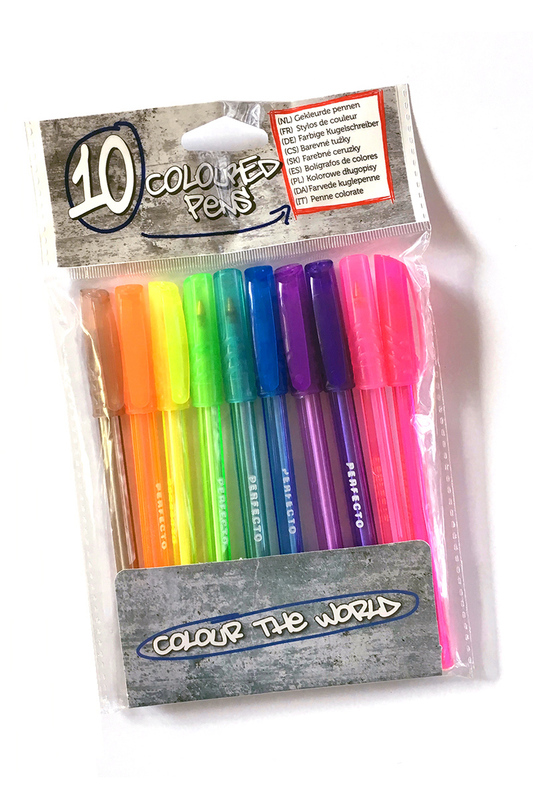 Buy the set and save $10.00. With the blessing of my client, I've made prints of my three swimsuit illustrations. They'd look great in your bathroom, beach house, lake home or pool. Each print is available for sale individually or you can buy a set of all three and save $10.00. Want to commission me to make something special for you? I really love being told what to do. (Seriously, I do!) Get in touch if you'd like me to create some custom artwork of your very own. As spring is quickly turning to summer in Southern Illinois, I thought it was a good time to look back and share my sketchbook with you. 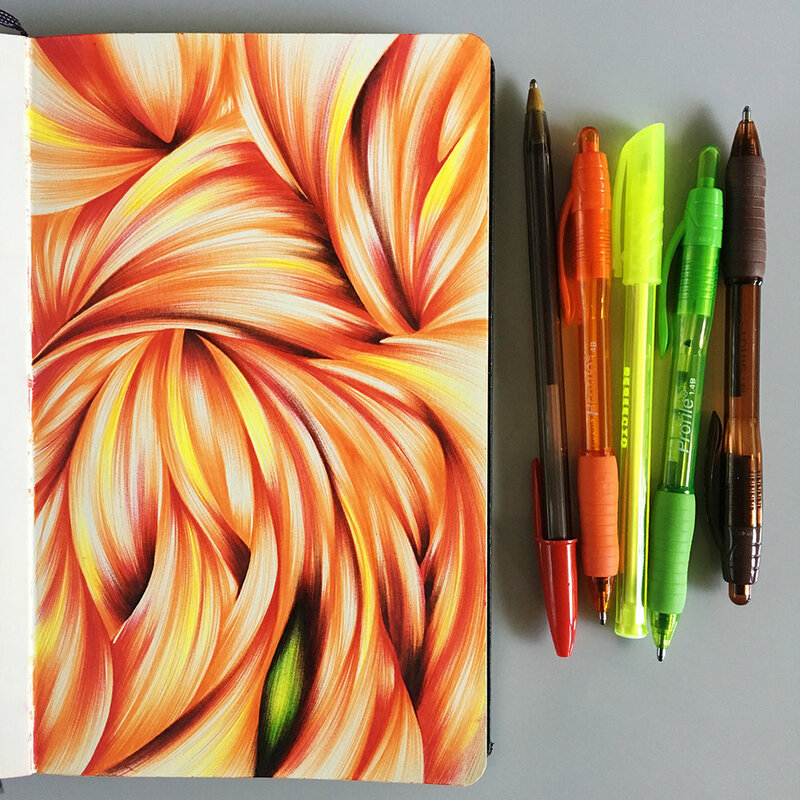 It's fun to see the work that I've created in my trusty Moleskine over the past 4 months. These drawings account for hours and HOURS of work. I work for days, even weeks on one page. It's hard to estimate the exact number of hours I put into a drawing, as they're done over many days. Let's say I average at least 8 hours per drawing. * The Amazon links in this post are affiliate links. If you click and purchase I will get a small portion of the sale at no additional cost to you. Thank you for your support. So, without any further adieu, here's my sketchbook. 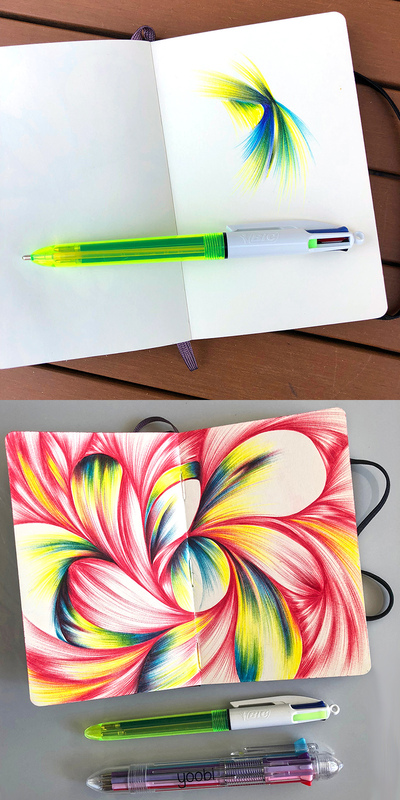 I got to experiment with my new Yoobi pen this spring. I will definitely be taking this 8-in-one pen with me to Europe this summer. On top of being ultra portable, the ink is really nice and smooth. I've been working on invitations for my brother's upcoming wedding. These were both experiments for the actual invitation, which has a desert/succulent theme. It was fun to work in one of my most favorite of color schemes. And before you ask, the burgundy pen is a Pentel RVSP. I've only been able to find these on Amazon. I suspect that they might not be manufactured any longer as they're about $5.50 a pop! But that color is pretty darn great, so I gave in and bought. I also experimented with my Perfecto ballpoint set that a generous patron sent me from the Netherlands. (Thank you Natasja!) The colors are so vibrant, especially the orange! These photos just don't do it justice. 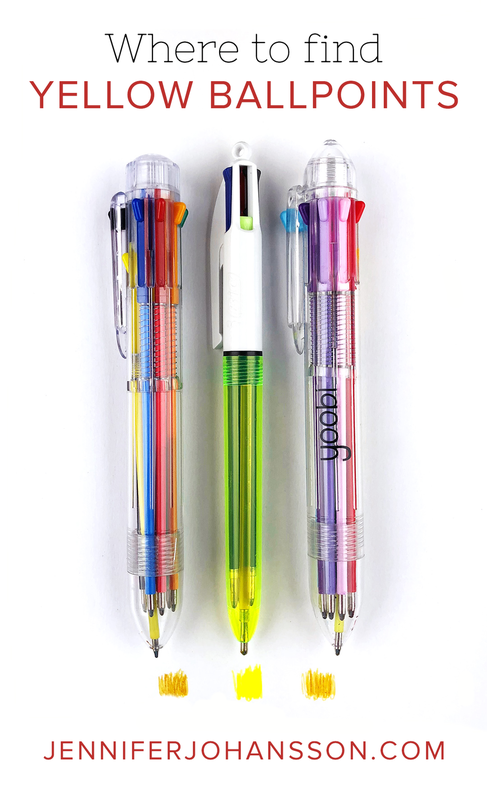 *I would link to these Perfecto pens if I could find them anywhere on the internet, but alas, they are nowhere to be found. I got a little patriotic with these two. Both were drawn to be backgrounds for voter postcards. You can see how I used the bottom drawing here. These are my most recent sketches. The blue one has become the background for my new Kentucky state print. I started the black drawing on top when I was particularly frustrated. I don't even remember why I was frustrated, I just know I needed to start drawing without any thought behind it. It's a weirdo, but I like it. I set out early in the year to make some large drawings outside of my sketchbook to submit to some museum shows. I made this one above, but I'm not so sure how I feel about it. 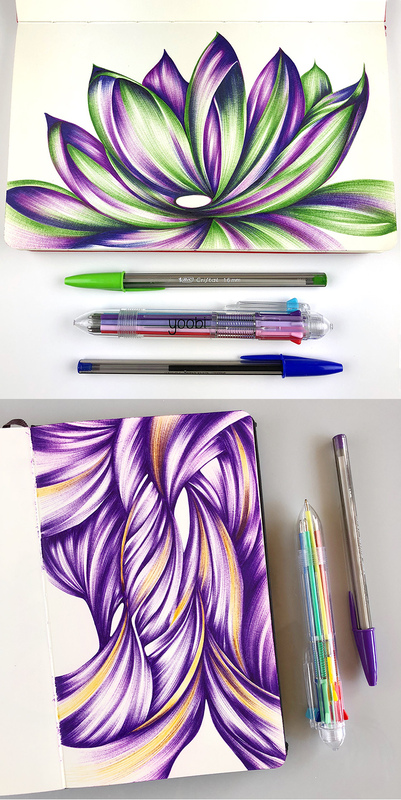 This concludes our Spring 2018 Sketchbook Tour. I hope you enjoyed it. I'm about to leave for a week on the beach, which usually means lots of time for sketch booking. Stay tuned! Before you leave.......Wanna keep in touch? Join my email list and you'll have access to a hyper lapse video of my drawing process.